This chart is in the shape of a yantra (a mystical diagram), with diamond-shaped houses. The Ascendant (known as the Lagna in Sanskrit) is always located at the top central position of the chart. The houses are read counter-clockwise from the Ascendant. In this diagram, H2 indicates the 2nd house, H3 the 3rd house, and so on. The arrows indicate the direction in which the houses are read. 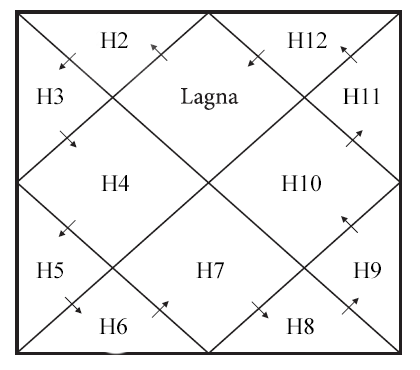 Since the Lagna is always set for this format, the typical North Indian chart will have numbers in each house to show what sign of the zodiac resides in that house. The zodiacal sign that is rising is indicated by a number from 1 to 12: Number 1 is Aries, 2 is Taurus, 3 is Gemini, etc. through each of the 12 houses. Thus, if number 3 is in the Lagna, Gemini is rising and is assigned to House 1, Cancer to House 2, Leo to House 3. 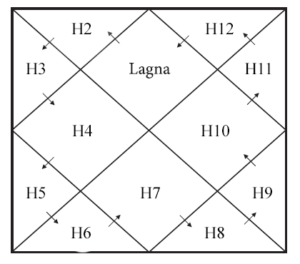 All North Indian charts are read like this, and the birth chart is typically shown to the left or above the Navamsha, the 9th harmonic chart.